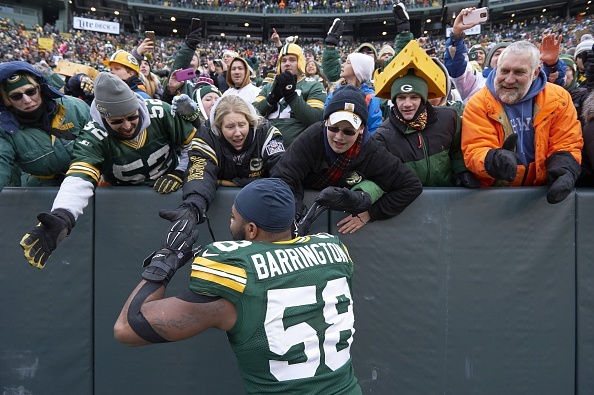 The Packers think starting inside linebacker Sam Barrington will miss the remainder of the season with a foot injury, Michael Cohen of the Milwaukee Journal-Sentinel reports. Barrington, 24, left the season opener against the Chicago Bears with an ankle injury and was later seen leaving the locker room on crutches with his right foot in a boot. Barrington first injured the ankle Sept. 1 when he dropped out of practice during training camp. He returned to the field Sept. 9 and was a limited participant in practice leading up to the game against the Bears. By the second quarter, Barrington was off the field and icing his right foot on the bench. His spot was filled by Nate Palmer, a third-year player from Illinois State. Palmer, who took over the communication headset following Barrington’s departure, played 61 of a possible 77 snaps and earned praise from defensive coordinator Dom Capers for his performance.